Atletico Madrid will take a slender Europa League semi-final first-leg advantage to Anfield next week thanks to a ninth-minute strike from former Manchester United front man Diego Forlan. In truth, however, the hosts will be regretting several opportunities they missed to add to their advantage. Liverpool, perhaps tired after their gruelling journey by land across Europe, will be grateful that they will not have to recover from a two or three-goal deficit following a poor game only redeemed by two good saves by goalkeeper Pepe Reina. Both sides went into the match missing key strikers and opted for a lone man up front with Atletico's Argentine international Kun Aguero suspended while injury denied Liverpool's Fernando Torres the chance to play against his former club. Atletico initially seemed to suffer the least from the absence of one of their key players. The Spanish side decided to test their visitors from the whistle and it quickly became apparent that the Liverpool back four were not sure how to deal with ex-Arsenal man Jose Antonio Reyes and Simao operating down the wings, with Jose Manuel Jurado playing just behind Forlan. Just nine minutes into the game, Jurado floated a cross to Forlan's head but, despite hardly making any contact, the Uruguayan international got a second chance when the ball fell to his feet and he poked it past Reina. The Liverpool defence recovered from the initial shock and gradually started to pick up their men but little creatively was coming out of the midfield with captain Steven Gerrard having another indifferent game. They were, however, unfortunate not to level when Yossi Benayoun beat Atletico goalkeeper David de Dea - but his effort was wrongly ruled out for offside. But both sides were failed to make the best of their first-half free-kicks and corners with each team guilty of poor passing from set pieces as well as when going forward. 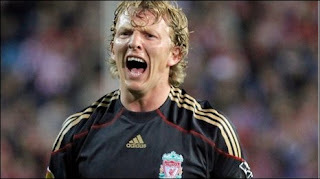 Finally, Liverpool started to come into the game with 10 minutes to go before half-time with, for the first time, Dirk Kuyt starting to find his range from out on the right flank. However, Atletico almost went two in front four minutes before the break when their Czech defender Tomas Ujfalusi stripped Daniel Agger of the ball on the right side of the box and skipped past two weak challenges before, trying ambitiously to score from a narrow angle, putting the ball into the side of the net. Atletico had another good chance just before the hour but a great save from Reina denied Simao, whose thunderous volley from an Ujfalusi cross looked on its way into the top corner. Despite Benitez swapping the ineffective David Ngog for Netherlands winger Ryan Babel after 63 minutes, the Dutchman fared little better with the chances he was offered, squandering an excellent opportunity in front of goal four minutes after getting on the pitch. The impressive Ujfalusi had another good effort with a rasping left foot shot 15 minutes from the end but Reina again showed why he is almost certainly going to be in Spain's World Cup squad, despite the plethora of options available to Spanish coach Vicente Del Bosque. The final minutes saw Liverpool - who have became the first English club to play in 16 European semi-finals - becoming increasingly desperate. And Atletico responded with some crude challenges which saw Valera get a late yellow card.